I recently posted a video of some homemade caterpillar tracks and I’ve had a few people ask how I was controlling the motors. It’s a very simple electronic process involving switching polarity. Reverse Polarity Switching - a clever sounding term for something that’s really very simple. 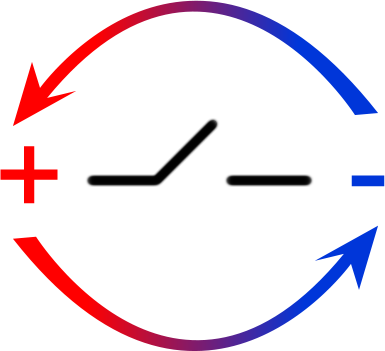 Polarity refers to the direction of a magnetic or electrical field. If you look at a simple battery it’s got two terminals – two ends metal ends. The electrical field travels in a certain direction and it's this direction that determines which terminal is which. Thus each terminal of the battery is said to have a 'polarity' and this polarity is either positive or negative. This is fairly important information when you’re plugging batteries into devices as the way electricity flows has a direct effect on electric items and the way they work. On most battery items, if you place the battery in the wrong way around, it doesn't work. On some items it can actually damage the electronics and on others it can make different things happen. For instance, if we connect the positive and negative from this battery to a simple brushed DC motor, the motor spins in a certain direction (perhaps clockwise). That’s because the electrical current flows through a coil inside the motor and reacts with enclosed magnets (this is not the same with brushless, induction motors - but that's not covered here). And that’s it in a nutshell… reverse polarity is changing the positive to a negative and a negative to a positive. With my caterpillar track motors, it wouldn’t have been very practical to manually swap the battery connections over whilst trying to drive it, so I used a couple of switches instead. 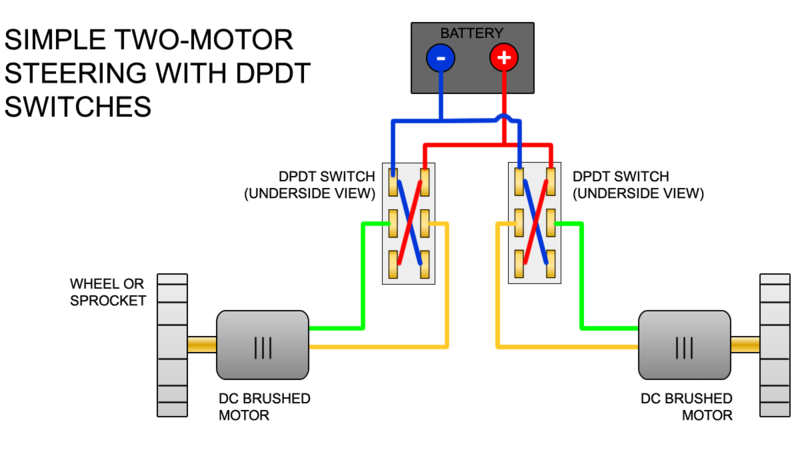 We can achieve reverse polarity in a more controlled manner simply by using DPDT switches, which stands for Double Pole Double Throw. They’ve usually got on-off-on settings. This, if memory serves me right, allows them to control four independent circuits I think… but let’s not worry about that here. The great thing about these cheap, easily available switches is that they can reverse polarity. They can do all that wire swapping bit for us. You’re looking at the underside of the switch here, where the terminals are. At first glance it might seem a little confusing but actually it's very simple. The input is the battery - so the red wire (positive) and the blue wire (negative) connect to the appropriate battery terminals and then to the end terminals of the switch (it doesn't matter which end, or which terminal). Now look at the way the red and blue wires cross over each other and connect to the other two end terminals - their opposite end terminals. As long as you remember that simple cross, you can wire one of these switches. The output is taken from the centre two terminals of the switch (green and yellow on my diagram, but colour doesn't matter). The polarity of the green and yellow wires is determined by which end you connected first or by the current position of the switch. But never fear... Clicking the switch will reverse the polarity. It's that easy... click one way green is positive and yellow negative. Click the other, yellow is positive and green is negative! As I said above, my caterpillar tracks are driven by two motors. For instance, having one motor go fully forward and the other fully reversed sends the model into a spin - the zero point turn caterpillar tracks are famous for. So there you have it... reversing polarity with a switch. Now it's confession time... whilst I did this, I wouldn't recommend it for large motors (as I used) other than strictly for testing. Large motors draw a lot of current. When taken quickly from one direction to another, they can draw massive amounts of current - up to twenty times as much I read somewhere. For this reason it's ideally necessary to use a speed controller. This is an electronic device specifically designed to deal with these current peaks and handle them safely. It's not only safer for you, it could also save blowing up your expensive motors. I talking more about speed controllers on the Radio Control page (which I later added to my tracks). With that said, the DPDT switch is a truly useful thing to remember. It comes in handy from time to time. Thanks for the great video!!! Lots of good info and I got some resolutions to a few problems that I've been having.